After a trip to the museum, Max writes a letter to his favourite dinosaur, the mighty T.
Rex - and the T. Rex writes back! As Max and T. Rex learn about each other's lives, a very unusual friendship develops in this funny and touching story from an award-winning duo. 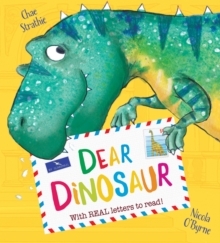 Dinosaur fans will love this interactive picture book with letters and cards to open, and dinosaur facts to discover along the way.